When Francois Hollande, the newly elected president of France, arrives today in Berlin for his first meeting with German Chancellor Angela Merkel, it will kindle memories of the long history of Franco-German partnership in leading the European Union. In France, it may even trigger the traditional condescension Parisian politicians feel towards their neighbors: the lumbering German economic giant that relies on French diplomatic, military, and nuclear savoir faire to achieve political clout. Increasingly, however, such sentiments are mere nostalgia. Yes, when the financial crisis broke out in 2007 and 2008, the relationship between France and Germany—and between Merkel and French president Nicolas Sarkozy (or “Merkozy” as they were dubbed)—took its usual place at center stage. But the real story since then has been Germany’s increasing comfort in claiming the spotlight for itself. It is a story that has left a riveted continent guessing what Germany’s ultimate intentions are. It’s important to point out that this shift has been a long time in coming. It was prefigured by the famous photo from the cemetery at the great World War I battlefield of Verdun, which depicted the massive figure of Chancellor Helmut Kohl holding hands with the diminutive President Francois Mitterand. But what irrevocably altered the balance in the Franco-German pairing was German unification in 1990. Germany’s addition of territories with a new population of some 16 millions upset the almost precise demographic equality of the European area, which until then had contained four large countries with almost the same population and economic size (the other two were politically unstable Italy and politically semi-detached Great Britain). For a time, the implications of the addition were hidden because of the enormous financial cost of rebuilding the eastern German territories, run down by the legacy of catastrophic communist central planning. But the extent of German power was also masked because of the insistence of that country’s political establishment on acting through multilateral institutions. Germany’s habit of making constant diplomatic reference to the alphabet soup of international organizations—EEC, NATO, WEU, CSCE—even had its own name, Genscherism, after the long-serving German Foreign Minister and co-architect with Kohl of German unification, Hans-Dietrich Genscher. In that way, the clearest evidence of Germany’s newfound comfort with its power is the language now used by Frau Merkel. Sometimes she addresses the European situation, and the need for austerity to be imposed on southern Europe, with a bluntness of language that reminds of nobody so much as Otto von Bismarck. 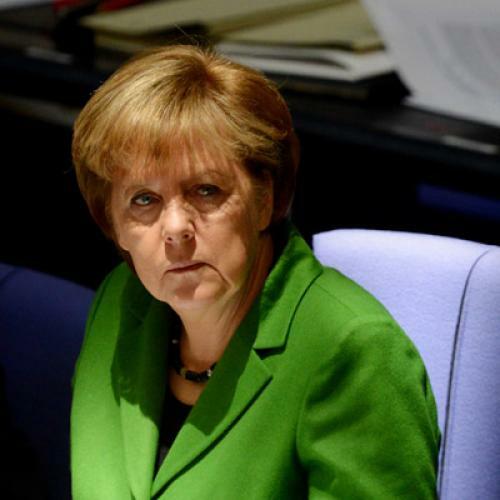 In May 2010, pleading to the German parliament, the Bundestag, to accept the first Greek rescue package, Merkel explained that “the rules must not be oriented toward the weak, but toward the strong. That is a hard message. But it is an economic necessity.” It had overtones of the Iron Chancellor’s 1862 “iron and blood” speech to the Budget Commission of the Prussian parliament, in which he explained that German unity would be achieved through demonstrations of Prussian strength, not Prussian liberalism. Three wars followed in short order, and Germany was, indeed, unified. Given modern Germany’s history as an aggressor, it is perhaps no surprise that foreigners are troubled by the new country’s new assertiveness in imposing harsh austerity conditions on southern Europe. In Greece, radical populist parties of the left and right routinely portray Merkel as a new Hitler. The technocratic prime ministers of Greece and Italy are often portrayed in the media of those countries as German puppets, and French electors have just booted Sarkozy from office in part because of his identification with Merkel. But the dismay about the new Germany is shared even in more rarified circles. Senior British officials and politicians do not hide their frustration with the “bloody Germans.” The Obama administration, meanwhile, is terrified that German insistence on austerity will provoke a new round of financial panic and economic crisis, which would not be confined to Europe, and which might turn the November election against the President. These anxious observers scrutinize the new European Überpower’s economic strategy in hopes of gauging its political ambitions. Technical debates about trade balances are thus seen as potential power bids by a new potential hegemon that wants to mould a new world with new rules. Just as Chinese trade and current account surpluses are thought to be discrediting multilateral institutions on a global level, German surpluses are threatening the political institutions that manage the process of European integration. (The German issue looks even more pressing today that that of China, in that China’s surpluses are rapidly shrinking, while the German level is only falling very slightly.) On the global level there is a fear of a new Chinese order, in which China develops patronage relations with a new quasi-empire in Africa and Latin America; and on the European plane, there is fear of a German Europe. Indeed, southern Europeans complain that German fiscal austerity is creating surpluses that come at their expense, that Germany is imposing deflation on the whole of Europe to exert its control over the continent. Some critics see Europe’s monetary arrangements as the key to a German master plan stretching back decades. The former British Chancellor of the Exchequer, Denis Healey, who clashed with Germany in the 1970s over German unwillingness to provide sufficient stimulus to the European economy, recalls a conversation with the most senior German Finance Ministry official, Manfred Lahnstein. Lahnstein told Healey that the idea of a fixed exchange rate arrangement (then called the European Monetary System) was that other European countries, with higher rates of wage increases, would progressively become uncompetitive relative to the German export machine. That would allow Germany’s social democracy to survive, but at the expense of unemployment and political and economic crisis elsewhere in Europe. Healey used this rationale as the explanation of why Britain should never allow itself to be drawn into such a scheme. When—so the conspiracy theory goes—the European Monetary System collapsed in a series of financial crises in the early 1990s, the Germans had a stronger than ever motivation to press ahead with a stronger version of the scheme, monetary union and the creation of the Euro. Germans thus turned multilateralism and Genscherism into a tool for securing German dominance. But it’s hard to believe that monetary union was simply a disguise for Germany’s lust for power; indeed, if it was, it seems destined to be a rather counter-productive exercise. (To be sure, the same can be said of Germany’s real rapaciousness in the first half of the twentieth century.) German firms may be able to do relatively well catering to demand from the rapidly growing emerging markets in Asia and the Middle East for machine tools, high performance luxury cars, and other engineering products. But it is unlikely that such success can be repeated forever. At some point Germany will face the problem of being a super-competitive economy surrounded and trapped in an impoverished region that is too poor to buy German products. That periphery would also be socially and politically unstable because of the ravages following from mass unemployment and especially from the destruction of the skills and potentials of a generation of young people. As with the German folk tale of Little Red Riding Hood, the greedy wolf is eventually fated to receive his comeuppance. But imperialistic conspiracy theorizing aside, there is a way to explain what is motivating Germany’s use of power. German attitudes of today are the product of a peculiar postwar success story. When American soldiers and diplomats made the postwar settlement, they believed that German political life had been destroyed because of inadequate constitutional guarantees. Adolf Hitler had used the emergency powers of the Weimar Republic’s federal constitution to destroy the power (which included control of the police) of individual German states, and also to stimulate the economy through monetary inflation. So Germany needed extremely secure bulwarks to secure constitutional and monetary stability. The two creations of the postwar era that have been most successful—and which also are regularly rated in opinion polls as commanding the greatest respect from Germans—are the Federal constitutional Court and the independent central bank, the Bundesbank. Both the Federal constitutional Court and the Bundesbank are central to the current situation, and they constrain Merkel’s room for maneuver. The Federal constitutional Court receives complaints about the political and democratic consequences of European rescue packages, that improperly impose commitments on German states that they have not themselves agreed on. Its ruling in September 2011 upheld the German federal government’s commitment to European rescue mechanisms, but at the same time drew a line, stating that further action would violate the German constitution, by transferring to much sovereignty from German citizens to supranational institutions (such as those created as a way of solving the Eurocrisis). The Bundesbank and its representatives, meanwhile, have taken a parallel position, based on a strict interpretation of the treaty-based mandate of the European Central Bank. Two German board members left the ECB board after warning that direct purchases of government securities would be a violation of the ECB’s statutes and the Maastricht treaty. Americans often like to think of themselves as pragmatists: If there is a bad crisis, you need to do what it takes to solve it. But the legacy of the postwar remaking of Germany was a deep commitment to legal rules—that a crisis is precisely when you need to create a workable system. The rather legalistic approach is at the core of the European process, not just of German postwar developments; and its constraints make a quick response to a sudden crisis impossible. But it bears reminding that not all European states find Merkel’s vigorous defense of the export model problematic. The more dynamic central European states, or the Baltic republics, see in Germany a model for emulation (in the same way as many Asian states based their development model on Japan). One of the big surprises of recent months was a plea from the Polish Foreign Minister for a stronger and more assertive rather than a weaker Germany. In fact, if an observer looked at Europe ignoring political boundaries, they would see a dynamic area stretching north from the Alps (including not only Austria, Slovakia, Slovenia, and Switzerland but also parts of central France and northern Italy) with a powerful tradition of skilled industry and the export of niche products. These areas are where German productivity is not perceived as a threat, but rather as a sign of hope that Europe has a strong role in the world economy. Still, Germany knows that the resentments against it will persist unless it can accept some enhanced measure of fiscal redistribution on the European level (as there has been between states in the United States since the Great Depression). Its only realistic option to that end may be to devise some sort of European tax (or even more radically perhaps a European social security regime) that would act as an absorber of regionally specific shocks. An obvious starting point for Europe would be to set some standard limit up to which national debt would be federalized—perhaps the notorious 60 per cent of GDP from the Maastricht convergence criteria, perhaps a lower limit. Debt exceeding that amount would be left to the responsibility of the national states. Germany’s current muscle flexing should be properly understood as a way to open up the bargaining for such a deal. It resembles, in fact, the position that Virginians took in 1790 in resisting the Hamiltonian assumption of state debts arising out of the war of independence. In the end, Virginia extracted big concessions—a limit to its liability and the moving of the federal capital. The new compact could also be made palatable to German voters, if it were structured in a way that would make the Europeanization of German interests clear. Germans could for instance be given tax incentives to buy assets in southern Europe: Companies could invest and bring in new business practices; households might think about buying some of those empty Spanish houses and apartments. There should no doubt: Germany is powerful, and Frau Merkel knows it. But the sources—and thus, the uses—of that strength have been misunderstood. It’s not just because of the success of a particular economic model—one strongly driven by export performance—but also because of a constitutional and legal order. None of this translates straightforwardly into political power in the way Merkel’s critics sometimes claim. But observers should not be so surprised that she is trying to remake Europe, however marginally, in her country’s image. Germany’s traditions, after all, have proven successful, and there’s reason to believe they can influence Europe for the better. Merkel’s actions don’t smack of imperialism, then, but of leadership. Harold James is the Claude and Lore Kelly Professor in European Studies at Princeton University.